The biological oxygen demand (BOD) also called biochemical oxygen demand. The BOD refers to the amount of oxygen required for the biotic degradation of organic matter in bodies of water. The conditions and the time how this testing is done is set and standardized, by the authorities. The BOD is a pollution parameter to asses the quality of effluent or wastewater. Drinking water is tested as well to check, if there is any organic matter present. To evaluate drinking water, more and more the TOC – Total Organic Carbon is meassured, instead of the biochemical oxygen demand. This TOC methode is faster and can be done online, whereas the methode to measure the biochemical oxygen demand takes several days to get results. The biochemical decomposition of organic substrates is carried out by microorganism. For this work the bacteria need energy. Aerobic bacteria, that do this work, need oxygen to produce energy. This oxygen is consumed in this process and the dissolved oxygen level in the water is reduced. If there is a lot of organic material present in the water, the oxygen demand is correspondingly high to carry out the decomposition. This oxygen is then lacking the plants and animals that also live in this water. The water quality is controlled by the authorities to protect users form health and other adverse effects of poor water quality. A high BOD level can indicate the existence of faecal contamination. Or particulate and dissolved organic carbon from various sources, neither from human nor from animal. This kind of contamination can seriously affect human health and cause problems to the industry. It is very important for every government to ensure a low BOD level in the effluent water leaving a sewage plant. As it is in public interest to have rivers, lakes and seas with a high level of dissolved oxygen. A low biochemical oxygen demand ensures that the dissolved oxygen is not only consumed by organisms from the wastewater. But that there is enough oxygen left for fish and plants. To achieve this common goal, international agreements have been reached. Such as the Resolution II and the detailed plans of the UN, made after the United Nations Water Conference. How to measure the BOD level? There are two methods to measure the BOD level. Both methods are empirical tests. Method I: This is the most common method. A specified sized BOD bottle is filled to the brim with water. The sample is left over 5 days at a constant temperature of 20° in the dark. Method II: The principal is the same as above. Again a specified sized BOD bottle is filled with a water sample and then it is diluted with de-ionized water. The amount of dissolved oxygen in the de-ionized water is known. The bottle is also left over 5 days at a constant temperature of 20° in the dark. Method II has to be used if the waste water contains a lot of organic pollution. By dilluting the water sample the results are more accurate. After the 5 day the left dissolve oxgen in the water sample is measured. With this figure the BOD level can be calculated. Drinking water should have after the 5 days a BOD of well below 1 mg/l. 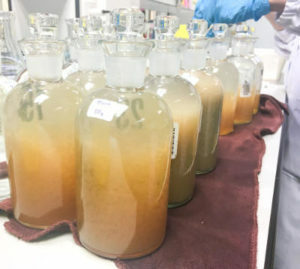 Acceptable wastewater from a sewage plant, will have a BOD of around 20 mg/l. As those methods are empirical the BOD indicator gives no absolute results. The indicator provides a good comparison among samples but it gives no exact measure of the contamination in the water. An alternative indicator to BOD is COD – Chemical Oxygen Demand. Anaerobic bacteria, such as SRB, dont need dissolved oxygen in the water to survive. Such microorganism are living on sulfur instead of oxygen, hence they cant be detected by the measuring the biochemical oxygen demand.